I just started reading Darker Than Black recently and so I felt inspired to make a wall ^^ I really love Hei's mask and how he uses it to hide his other self. I feel like it holds a lot of his power and so that's what I wanted to focus on in this wall. Comments/faves are really appreciated. Hope you like it! simple yet, have very deep meaning inside!.. 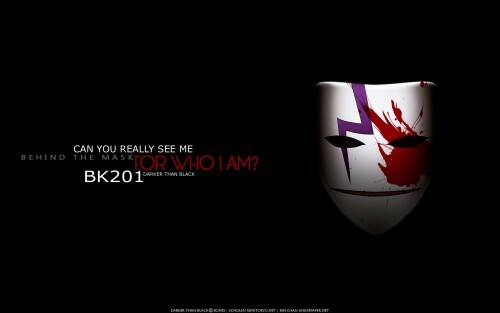 simply perfect, the mystery behind the mask is great! Really cool! I like it a lot. Nice wallpaper! So simple yet Great! Awesome! Beautiful! Loved it! Thanks! cool wallpaper. thanks for sharing this pic! This is amazing. I love it! Beautifully done. I love the simplistic style..Neat and elegant..